“As an accounting major, it’s exciting to apply what I’ve learned in the classroom to real tax returns. 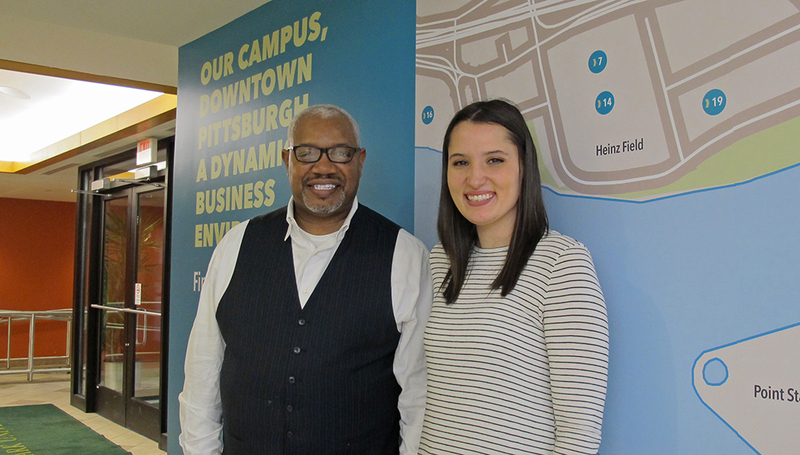 Not only am I gaining first-hand knowledge of the tax field, but I’ve also had the opportunity to meet so many amazing people in the Pittsburgh community." Through the IRS Volunteer Income Tax Assistance program, junior accounting students Kortney Lampel and Gary Mills are gaining experience in tax return preparation and learning firsthand about IRS rules and regulations — all while helping low-to-moderate income families with their taxes. “I found out about VITA through Professor Clark and the Student Accounting Association and it seemed like an awesome program. Everyone had nothing but great things to say about it,” said Lampel, a graduate of Windber Area High School in Windber, Pa.
Lampel is secretary of the Student Accounting Association and treasurer of United Student Government. “I decided to become a VITA volunteer so I could give back to my community and help low-income residents in Southwestern PA,” explained Mills, a graduate of T.C. Williams High School in Alexandria, Va.
“Volunteering is one of the best ways to become involved in making society a better place,” Mills added. Both accounting students are volunteering for the VITA program at YWCA Greater Pittsburgh, located right next to campus.